The China Sea Dragon King Arcade Game is an English version, video redemption fish hunting arcade game, available as an upgrade kit and in a 6, 8 or 10 players arcade cabinet! This easy to play game includes exciting gameplay features and new characters with special attributes, and new 3D rendered undersea stages and fishy characters for players to catch! The cast of characters include a total of 19 fish characters, some more familiar than others, such as: Lantern Fish, Devilfish, Fugu, Butterfly Fish, Sea Turtles, Spearfish, Killer Whale, Humpback Whale, Drill Crab, Laser Crab and more! There are a range of new additions to the characters however, including: -The Giant Pink Jellyfish -Laser Shark -The mermaids -the Golden Lobster -Jumbo Fish – giant versions of smaller, low value fish -Fire Crab -the China Sea Dragon King; and more! Certain characters also carry reward features for players when caught, which makes the game even more interesting for players. The China Sea Dragon King Arcade Game reward features include: -China Sea Dragon King – catching the Dragon King will release a super bomb explosion that will catch all the fish onscreen. -Fire Crab will reward the player who catches it with 30 seconds of free shooting time -Whale king is the Humpback Whale character. When caught it will give players 30 seconds to collect as many credits as they can with the quick shoot function - the faster you hit the ‘SHOOT’ button in that 30 seconds, the more credits the player will get! The China Sea Dragon King game also features a range of special weapons with which to catch these crazy characters. Including: -Energy Cannon – fire for 30 seconds without any effect to your gun charge; -Circular Power Grid – emits a shock grid area and moves around the playfield shocking anything that touches the area; -Arrow weapon — when players catch a fish with this weapon, it will also catch all fish of the same species on the screen with long arrows; and -Convenient Operation weapon – Auto Attack / Aim Attack makes the game operation more convenient and easy, allowing you to hit the bigger fish without worrying about all the smaller fish in the way. The game still features other regular mini games and features as well, including Lightning Chain, Drill Crab and Laser Crab. The China Sea Dragon King Arcade Game is available in an Upgrade Kit, as well as dedicated fish arcade cabinets, including a 6 player 32” model, 6 player 58” model, 8 player 58” model, and a 10 player model with two 58” monitors. All cabinet come with various configuration options too, including Key In/Out, Coin In/Out, Ticket Dispenser, Note Acceptor, and Thermal Printer. The China Sea Dragon King Arcade Game is a thrilling English version fish game with simple gameplay to welcome new players and challenging mini game features for experienced players to enjoy! Plus with so many cabinet options available, this game can be customized to suit a wide variety of locations, and to meet the needs of operators and their players. This easy to play game includes exciting gameplay features and new characters with special attributes, and new 3D rendered undersea stages and fishy characters for players to catch! the China Sea Dragon King; and more! China Sea Dragon King – catching the Dragon King will release a super bomb explosion that will catch all the fish onscreen. Whale king is the Humpback Whale character. When caught it will give players 30 seconds to collect as many credits as they can with the quick shoot function - the faster you hit the ‘SHOOT’ button in that 30 seconds, the more credits the player will get! Convenient Operation weapon – Auto Attack / Aim Attack makes the game operation more convenient and easy, allowing you to hit the bigger fish without worrying about all the smaller fish in the way. The game still features other regular mini games and features as well, including Lightning Chain, Drill Crab and Laser Crab. The China Sea Dragon King Arcade Game is available in an Upgrade Kit, as well as dedicated fish arcade cabinets, including a 6 player 32” model, 6 player 58” model, 8 player 58” model, and a 10 player model with two 58” monitors. All cabinet come with various configuration options too, including Key In/Out, Coin In/Out, Ticket Dispenser, Note Acceptor, and Thermal Printer. The China Sea Dragon King Arcade Game is a thrilling English version fish game with simple gameplay to welcome new players and challenging mini game features for experienced players to enjoy! Plus with so many cabinet options available, this game can be customized to suit a wide variety of locations, and to meet the needs of operators and their players. 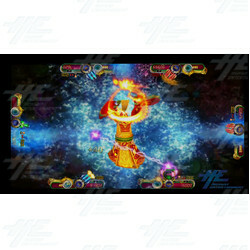 China Sea Dragon King Arcade Game is a fun new video redemption game! Win big with this fish hunting arcade machine and it's fun, addictive features!